Primary texts (Pseudepigrapha, Targum, Midrash, Targum) about Messainic Expectation. Comparative texts about Baptism: Water & Spirit from DSS, Josephus, Babylonian Talmud. At (Rutgers University Dept of Religion) Mahlon H. Smith's Into His Own: Perspective on the World of Jesus companion to the historical study of Christian texts. "John Baptizes Jesus," "Disciples Find Jesus," The Jesus Database, an online annotated inventory of the traditions concerning the life and teachings of Jesus. Dr. Gregory C. Jenks, FaithFutures Foundation. "If it was when He was already baptized that John knew Him, how saith he to Him, coming to baptism, "I have need to be baptized of Thee"?" "As yet, in the darkness of this life, we walk by the lamp of faith: let us hold also to the lamp John, and let us confound by him the enemies of Christ; indeed, let Christ Himself confound His own enemies by His own lamp." "Even holy things may be hurtful. In the good, indeed, holy things are to salvation; in the evil, to judgment." "Do not, then, seek Christ elsewhere than where Christ wished Himself to be preached to you; and as He wished Himself to be preached to you, in that fashion hold Him fast, in that manner write Him on your heart." "The body and truth of all the sacrifices of the law, to make satisfaction for the sin of the world, is Christ." "The strongest and most prevailing argument with an awakened soul to follow Christ, is, that it is he only who takes away sin." "They followed Jesus - They walked after him, but had not the courage to speak to him." "What seek ye--gentle, winning question, remarkable as the Redeemer's first public utterance." "In true missionary spirit Andrew at once and first sought his own brother." "Hear ye, then, the witness of John. The Christ, who came from Nazareth to be baptized of him in Jordan, he on whom the Holy Ghost descended like a dove, "this is the Son of God." This is the sin-bearing Lamb. Oh, that you and I might fulfil John's expectation, for he spoke that we might believe." "The Lamb of God in Scripture," John 1:35,36, Charles H. Spurgeon, 1893. "Take your eyes off everything else, and behold the Lamb of God! You need not see anything else, nothing else is worth seeing; but behold Him." "What Are We Looking For?" Manoj Mathew Zacharia, Modern Metanoia, 2017. "The First Disciples," Commented Bible Passages from Taize, 2014. Commentary, John 1:29-42, Richard Swanson, Preaching This Week, WorkingPreacher.org, 2014. "Perhaps one of our required reflections, we who confess that God's messiah has come to a weary world "in sin and error pining," must be on the adamant stubbornness of the pain of the world. This, also, is what a "theology of the cross" must meditate on." "If you really want to understand why the church is declining in North America, you need to recognize how frightened most of our people are by the word 'evangelism.'" "Can you think of times when you were invited to 'come and see?' In your experience what difference did the 'seeing' make?" "Followers of the Lamb," Nancy Rockwell, the Bite in the Apple, 2014. "All these lights – all these baptisms and new beginnings – and becoming followers of light- is about becoming part of the Great Story, in all its particulars and in the many different names and tellings by which it lives on." "Pigeon, The Poor Man's Sacrifice," Sonya Olson, Question the Text, 2014. "It's Him! The Lamb of God!" Bob Cornwall, Ponderings on a Faith Journey, 2014. "'Scaping the Goats," Andrew Prior, 2014. Comentario del San Juan 1:29-42 por Elizabeth Gareca Gareca, Working Preacher, 2014. Commentary, John 1:29-42, Audrey West, Preaching This Week, WorkingPreacher.org, 2008. Comments (commentary) and Clippings (technical notes for in-depth study), Epiphany, Chris Haslam, Anglican Diocese of Montreal. Lamb of God, audio telling, story in episodes, graphic, audio and written commentaries. Go Tell Communications, Biblical Storytelling for the Global Village, 2011. "First Thoughts on Year A Gospel Passages in the Lectionary: Epiphany 2," William Loader, Murdoch University, Uniting Church in Australia. "John?s gospel uses messianic imagery to underline its message that the Father sent the Son to overcome evil and darkness with light and truth." "Perhaps in most congregations, it might be more effective to ignore all the different possible Christological implications of these titles, and simple tell a story about little Andrew who responded to the invitation to come and see and then did his own small part to spread the knowledge of the Messiah to his brother and throughout his town." "Jesus refers to [Peter] first in terms of his familial association, that most basic old world connection, then refers to him in terms of his new name, Cephas, symbolic of his being made a new person." Holy Textures, Understanding the Bible in its own time and in ours, John 1:29-42, David Ewart, 2011. "This text has two questions and an invitation that are at the heart of the Gospel of John: What are you looking for? Where are you Staying? Come and see." "You Pointing at ME?" Jennifer Johnson, The Hardest Question, 2011. "Why didn't he hang out with Jesus, and if he did, how come the Gospel writers don't record it?" "Introducing Jesus: Reflections on John 1:29-34," Alyce McKenzie, Patheos, 2011. Dylan's Lectionary Blog, Epiphany 2A, 2005. Biblical Scholar Sarah Dylan Breuer looks at readings for the coming Sunday in the lectionary of the Episcopal Church. "...when John the Baptizer says, 'Look -- the Lamb of God,' he is articulating a hope that spanned multiple cultures in the ancient world." "Two Witnesses: John the Baptist and Andrew," Gospel Analysis, Sermons from Seattle, Pastor Edward F. Markquart, Grace Lutheran Church, Seattle, Washington. Detailed background and exegesis. "The Church of Jesus Christ and our congregation needs a whole lot more ?Andrews,? people who believe in Christ so much that they are willing to talk about Christ to our closest relatives." "The Lamb of God," Rev. Bryan Findlayson, Lectionary Bible Studies and Sermons, Pumpkin Cottage Ministry Resources. Includes detailed textual notes. "A Humble Witness," Ordinary A2, Larry Broding's Word-Sunday.Com: A Catholic Resource for This Sunday's Gospel. Adult Study, Children's Story, Family Activity, Support Materials. "Which of your friends demonstrates the virtue of humility? How important is that person to you? To your family and community?" Wellspring of the Gospel, Ordinary 2B, Catherine McElhinney and Kathryn Turner, Weekly Wellsprings. "How would you spend a day with Jesus - so He could get to know you - and you to know Him?" "The change of name for Simon is indicative of the future role he will play. Only John among the gospel writers gives the Greek transliteration (Khfa'") of Simon's new name, Qéphâ (which is Galilean Aramaic). Neither Pevtro" in Greek nor Qéphâ in Aramaic is a normal proper name; it is more like a nickname." "The Witness of John (John 1:19-37)," by Robert Deffinbaugh at the Biblical Studies Foundation. "John does not assume that a devoutly religious person is exempt from the preaching of the gospel and the need for repentance and forgiveness of sins." "Come and See," James T. Dennison Jr., in Kerux: The Online Journal of Biblical Theology (Reformed). "The eschatological king comes to complete and to fulfill all the imagery of kingship of the former era. Israel's monarchy was launched in a shepherd-king, one who protected and ruled the flock of God. Israel's failed monarchy set the flock of God yearning for the ideal king who would reign in true righteousness and justice." "Now is the time to make sacrifices to our God that are substantive, that come from the heart, that will impact the future of all life forms on our earth." "Come and See," Ordinary B2, Larry Broding's Word-Sunday.Com: A Catholic Resource for This Sunday's Gospel. Adult Study, Children's Story, Family Activity, Support Materials. "When was the last time you received an invitation? What expectations did you have? Have you ever been surprised by what you saw?" "Spirit-Baptism in the Fourth Gospel. A Messianic Reading of John 1,33," Cornelis Bennema, Biblica Vol. 84(2003) 35-60. "The various ways of understanding 'baptism in the Holy Spirit' has caused much division in both academic scholarship and the church." Recommended articles from ATLAS, an online collection of religion and theology journals, are linked below. ATLAS Access options are available for academic institutions, alumni of selected theological schools, and clergy/church offices Annotated list of "starting place" articles at ATLAS for this week's texts (includes direct links)..
Brown, Raymond E., S.S., "Three Quotations from John the Baptist in the Gospel of John," The Catholic Biblical Quarterly, 1960. Cousar, Charles B., "John 1:29-42: Expository Article," Interpretation, 1977. Craddock, Fred B., "Sent of God to Witness," The Christian Century, 1990. Daniel, Lillian, "Grand Introductions," The Christian Century, 2002. Franzmann, M. and M. Klinger, "The Call Stories of John 1 and John 21," St. Vladimir's Theological Quarterly, 1992. Hutchison, John C., "Was John the Baptist an Essene from Qumran?" Bibliotheca Sacra, 2002. Kim, Stephen S., "The Relationship of John 1:19-51 to the Book of Signs in John 2-12," Bibliotheca Sacra, 2008. Montgomery, David A., "Directives in the New Testament: A Case Study of John 1:38," Journal of the Evangelical Theological Society, 2007. Norris, Kathleen, "Living by the Word," The Christian Century, 2008. Painter, John, "Quest and Rejection Stories in John," Journal for the Study of the New Testament, 1989. Ralls, Mark, "The Other 'H' Word," The Christian Century, 2005. Sandy, D. Brent, "John the Baptist's 'Lamb of God' Affirmation in Its Canonical and Apocalyptic Milieu," Journal of the Evangelical Theological Society, 1993. Smith, Robert H., "'Seeking Jesus' in the Gospel of John," Currents in Theology and Mission, 1988. Skinner, Christopher W., "Another Look at 'The Lamb of God,'" Bibliotheca Sacra, 2004. Willson, Patrick J., "Come and See," The Christian Century, 1993. "A Call to Discipleship & the Pledge of Nonviolence," Reflections based on John 1:35-42 & the Life of Martin Luther King, Jr., Institute for Peace and Justice. "Andrew," Pastor Edward F. Markquart, Grace Lutheran Church, Seattle, Washington - Sermons from Seattle. "In the Right Place at the Right Time," the Rev. Rosemary Brown, Day 1, 2000. "Do I Have a Witness?" the Rev. Ruben Duran, Day 1, 1996. Worshiping with Children, Epiphany 2, Including children in the congregation's worship, using the Revised Common Lectionary, Carolyn C. Brown, 2014. 2011. "Storypath Lectionary Links: Connecting Children's Literature with our Faith Story," January 19, 2014, Union Presbyterian Seminary. Connections: John 1:29-42 and Follow Me by Tricia Tusa. 2011. 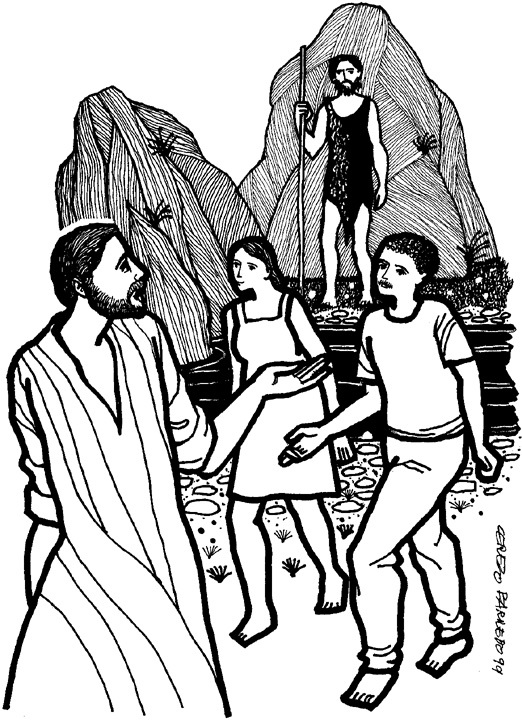 "John the Baptist," Illustrating the Story (lessons, children's sermons), coloring pages, activity sheets, crafts, children's songs. MSSS Crafts. "Show and Tell," Charles Kirkpatrick, Sermons4kids.com. "It Is Written!" The Children's Chapel. "Jesus Is Baptized by John in the River Jordan," Sunday School Lessons: Family Bible Study, art projects, music, stories, etc. "The Trash Collector," Bryan Clements, sermons4kids.com. Behold the Lamb Crossword Puzzle, Charles Kirkpatrick, sermons4kids.com. 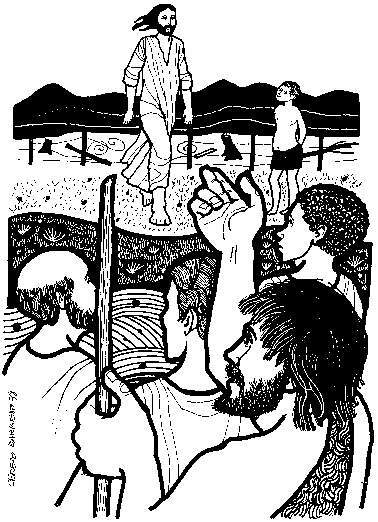 "Baptism in River Jordan," "The Broken Bamboo," from A Certain Jesus by Jose Ignacio and Maria Lopez Vigil. Ideal for catechetical and liturgical dramatization of today's gospel. Claretian Publications. Clip Art, John 1:29, Fr. Richard Lonsdale, Resources for Catholic Educators. Clip Art Images: John 1:35-42, Misioneros Del Sagrado Corazón en el Perú. John 1:29-34, John 1:35-42, at Cerezo Barredo's weekly gospel illustration. Liberation emphasis. Hymns with Scripture Allusions: John 1:29, 36. The Cyber Hymnal. "The Lamb's Embrace," TEXT: Mark Ryman (2005) based on John 1:29-42. TUNE: ?Aberystwyth (Parry),? Joseph Parry (1879). New Hymns for the Lectionary.